“I solemnly pledge to dedicate my life to the service of humanity. The health and well-being of my patient will be my first consideration… I will maintain the utmost respect for human life…” In a modern reiteration of the Hippocratic oath adopted by the World Medical Association, our physicians vow to respect human life: specifically, the life of the patient. But what about the life of the physician? Do we remind our doctors to take care of their own physical and mental health? As the numbers indicate, not enough; suicide rates among physicians across the globe are higher than the general population. It seems that in directing all of our attention to the best care of the patient, we have forgotten one very important thing: doctors are humans. And as humans, they too, are prone to emotional distress from traumatic experiences and overwork. It all starts with the tremendous workload and pressure that students undergo in medical school. Becky Lee, a medical student at the University of Maryland School of Medicine, recounts her development of depression. The excitement she felt on the first day of medical school quickly spiraled into feelings of apathy, dread, and fatigue as she experienced an overwhelming workload and crippling social isolation. At first, Becky was convinced that she was alone: she even felt ashamed at her inability to cope with such a strenuous education. However, that is far from the truth. Depression, one of the greatest risk factors for suicide, is significantly more prevalent among medical students and practitioners than in the general population. The American Foundation for Suicide Prevention reports that 28% of residents experience major depressive episodes during their training, a proportion three times greater than similarly-aged individuals outside of the medical profession. As for physicians, a 2018 Medscape survey reports that 46% responded that they were depressed, burned out, or both. Specialties with the highest rates include neurology (55%), critical care (54%), and internal medicine (50%). It is important to note that this is a global phenomenon: the Annals of Translational Medicine reports that in Asia, 98% of pre-clinical 60% of clinical students screened for depression. Unsurprisingly, higher instances of depression amongst physicians correlate to higher suicide rates. A study published in the American Journal of Psychiatry found that, in the United States, male physicians are 1.41 times more likely to commit suicide than males in the general population. For women, this rate is 2.27 greater. As with depression rates, this phenomenon is not confined to the United States: The Journal of Holistic Health Care reports that suicide rates among female physicians in England were also higher than the national average, as well as that of their male counterparts. One reason for this may be the high rates of sexual harassment experienced by female physicians. According to the Surgical Chronicles, during general surgery training, 54% of female medical students experience sexual harassment or some form of gender-based discrimination. This increased stress in workplace relations undoubtedly intensifies the stress of the profession itself. The important question now is how do we prevent more deaths? Becky Lee, the medical student previously mentioned, urges increased awareness and prevention programs centered around mental health. While struggling with the crippling symptoms of depression, Ms. Lee was afraid to utilize the counseling services at first due to fear of judgment by her peers. The stigma associated with mental health disorders extends into the professional medical field: Medscape reports that only 33% of physicians suffering from depression seek professional help. However, obtaining such help can have a considerable positive impact: a study published in the Public Library of Science found that suicide rates in municipalities in Japan containing at least one psychiatrist in the area were significantly lower. As Ms. Lee put it, the worst part depression is suffering silently. When she finally did decide to visit her counseling service, a few words of validation and solidarity in knowing that she was not alone went a long way: she finally began her recovery journey. 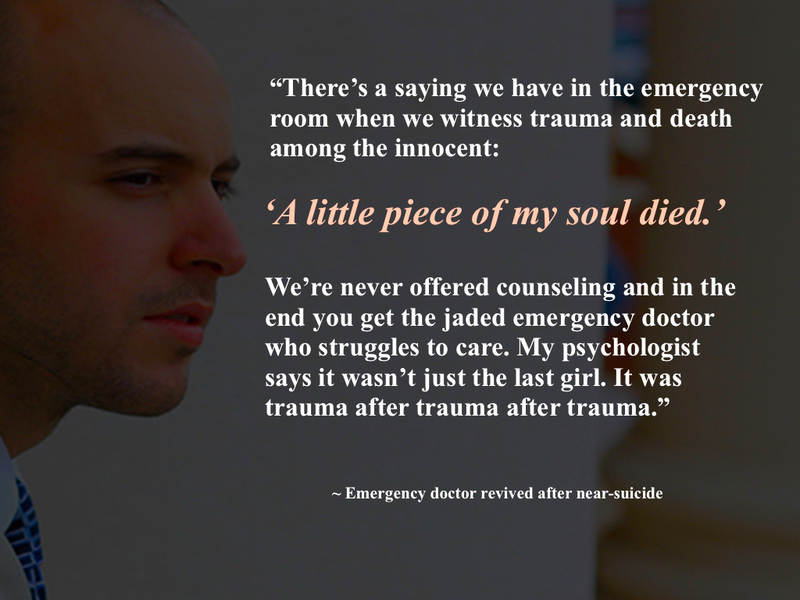 In order to save the lives of our physicians, we need to deconstruct the stigma against mental illness. And in order to do that, we need to speak openly about these issues. One medical school taking precautionary action is the University of Southern California School of Medicine, which requires all of its students to undergo mental health screenings and take several days off per year. Whether it be making suicide-prevention education a mandatory part of healthcare training or just handing out a few pamphlets, no action is insignificant if it helps save the life of one person. For the sake of our caretakers and every person whose lives they sustain, let us act now to reduce the number of these tragedies in the future. Please stay tuned for a new documentary called “Do No Harm”, you can watch the trailer here!